Early voting runs until Friday, Dec. 7. Election Day is Tuesday, December 11. Residents of City Council Districts 1, 3, and 8 can vote in those races. All Austinites can vote for the seats in AISD District 9 and ACC Place 8. Last week, in a surprise rebuke to the President, the Senate voted 63-37 to advance a resolution to stop the US support for the Saudi war in Yemen. Less surprising is that Senators Cornyn and Cruz were among the 37 who are on the wrong side of this issue. The Senate is likely to take up the resolution again this week. There is still time to change minds. Call Cruz and Cornyn and ask why they continue to support a war in which 85,000 children under age 5 have died from starvation since 2015. Also ask them to support their colleagues Corker and Menendez’s demand for a determination on the role of the Saudi Crown Prince in their role of journalist Jamal Khashoggi. The President continues to side with autocrats over the American people. We need our Congress to do their job and provide a check on Trump’s corruption. Are you stumped by how the Lege works? Want to engage on specific issues next session? 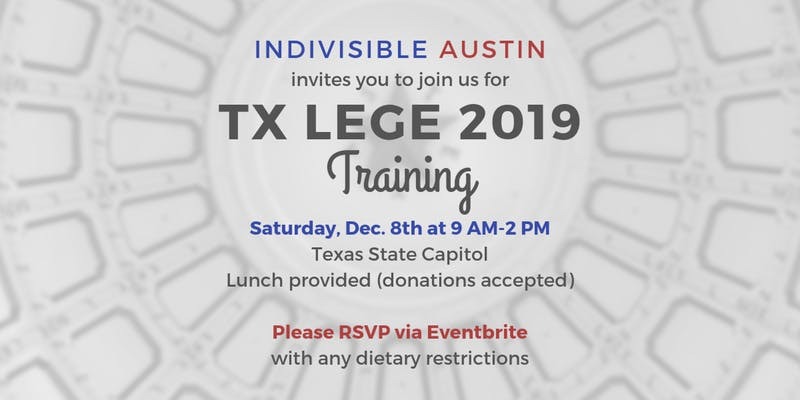 Join us December 8th for an Indivisible #txlege training. 9 a.m. to 2 p.m. at the Texas State Capitol, 1100 Congress Ave. The further we get from the election, the more we see how significant our gains were. The more we see how significant our gains were, the more we realize just how much farther we have to go just to get back to even, with all that Trump has done to our country—and “back to even” isn’t good enough for our marginalized communities. But now, with the tremendous gains that we saw in the election, we can also see a path forward to celebrate, protect, and expand democracy and human rights to drive justice, equity, and inclusion. We’ve got a long way to go. Go with us. Help us get there by making a gift to Indivisible Austin today.